Frederik Lasage MARCEL Observatory, London School of Economics and Political Sciences, Media and Communications Dept. Considerable research has been done recently on how designers and engineers can collaborate with artists in order to find innovative uses for information and communication technologies. The Access Grid has been a noteworthy example of this kind of collaboration. Its status as a flexible tool for videoconferencing has enabled many different kinds of technical experimentations. But could this flexibility in itself a limitation? 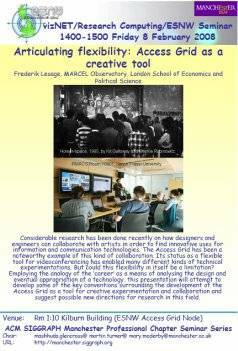 Employing the analogy of the ' career'  as a means of analysing the design and eventual appropriation of a technology, this presentation will attempt to develop some of the key conventions surrounding the development of the Access Grid as a tool for creative experimentation and collaboration and suggest possible new directions for research in this field.